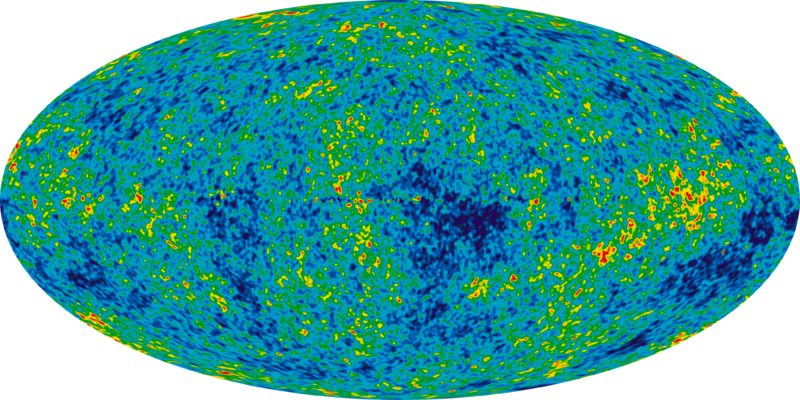 The WMAP image of the universe taken in the microwave region of the electromagnetic spectrum. Happy New Year! In order to celebrate the coming of 2014 I thought I’d share the fantastic image captured by the WMAP satellite, depicting a ‘baby universe’ just 375 000 years old. In the picture you can see the afterglow of the big bang and the origins of all life. I think it is a fantastic thing to be able to look back in time at our early universe using the tools of astronomy and in doing so investigate the fundamental Physics that governs our universe today. The information gathered by the WMAP satellite was used to determine the age of our universe – 13.77 billion years – along with the curvature of space and the fact that dark energy makes up 71.4% of our universe! The WMAP satellite also provided evidence for inflation, a dramatic period of expansion hypothesised to have occurred in the first few moments after the big bang.